Great post Chris. The main point of using extended events is that is has less overhead on the server being examined when tracing compared to running the same in Profiler. 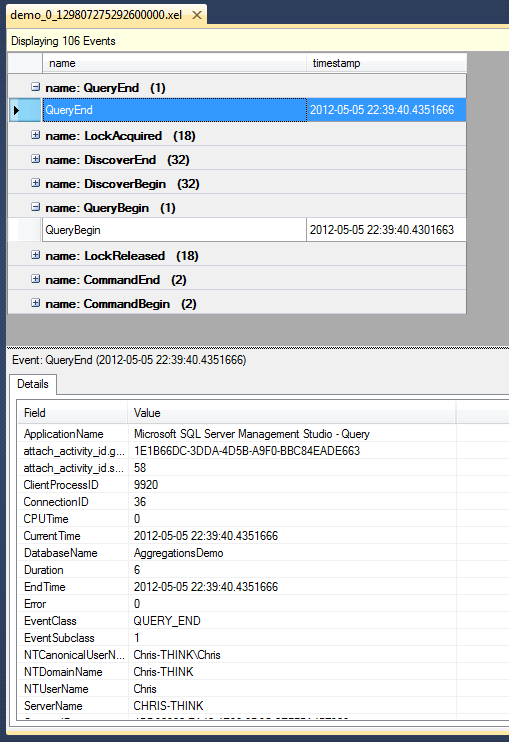 Is there no way to define these using management studio or similar GUI as we do with SQL extended events? While the ability to get this information using the new tracing model is really great, it seems a cumbersome way to manage the traces. No, there’s no GUI to do this unfortunately. Thanks very much for digging in this stuff, when MSFT is dropping the ball. Chris – can the logging information be sent to a SQLSERVER datatabase table instead of a file? Hey Chris, the answer to this is no across the board with XE because that was one of the worst performing aspects of the old Profiler for SQL Trace, writing directly to a table. You’d have to read the xel file in the UI and then export the results into a table after the fact to do that. Thanks very much for this post Chris. I found the Microsoft example yesterday and discovered how unhelpful it is for myself. With your post I’ve been able to set up a trace to get exactly what I want in about 10 minutes. any idea ? it s a namespace issue I don’t know, really, how to fix it. This post has helped me a lot, since it is still almost impossible to find information from Microsoft on this topic. I’ve got a question though: is it possible to specify the columns logged either globally or (preferrably) per event? I honestly don’t know – I would have thought it was possible though. analysis services) and not releasing them. package runs fine to move the files when second trace is not running. to track SSAS Cube Usage Stats? It should be possible to have two traces running, I think. Maybe you’ve found a bug? If so you should probably report it to Microsoft. Is it be possible to have 2 XEvent trace (with different ids) running on a single analysis server? I am doing this to track SSAS cube usage stats. While the first XEvent trace is running, if I delete the second trace the ssas is still accessing the 2nd trace’s .xel files and not allowing to access them. It is releasing them when I delete 1st trace. Hello, Is there a way query .trc file using function ::fn_trace_gettable, I can open the .trc file if it generated for SQL server database, but not for SSAS (Tabular).